My home state, New Mexico is right now burning dangerously with the Las Conchas Fire. And, we have the potential for nuclear contamination. Here is a report from home. I live inside a small old true adobe home. During summer months I keep the windows open at night when it is cool outside and during the day when it is hot I keep them closed—natural air conditioning in the high desert. But since Sunday June 26 I’ve had to keep all windows closed to avoid toxic ash from wildfires from entering the breathing space inside the house. The result—I’m hot as hell inside my home and can’t sleep properly. My friends are sharing similar stories. This is not what I was hoping for when I returned on Sunday from the very green Bloomington, after a weeklong trip. There, at Indiana University, I gave a keynote speech at the Species, Space and the Imagination of the Global biennial conference of the Association for the Study of Literature and Environment. There were more than 800 attendees who came from all over the world. The title of my talk was Ecocultural Rights: Stories from the North, and also the South. I talked about the massive death of the old–growth piñon forest (our state tree) in New Mexico from recent climate change—90% of our mature piñons are already dead from bark beetles infestation, and more are still dying. This must be considered an epic ecocultural loss. From Albuquerque airport to Santa Fe, I sat on the front seat of the shuttle van. I like to gossip with the driver about matters of local concerns. Marcus, our driver, an African–American man of perhaps about my age told us about the extreme wind that may slow us down a bit from the usual hour–long journey. Then, Marcus started telling me about the terrible New Mexico wildfire and its various public health hazards from toxic matters. I told him that I was familiar with the fire he was talking about. But soon we realized we were talking about two different fires—he was talking about the fire that started earlier that day in the Jemez Mountains and I was talking about the fire I had seen before I left town. During a walk/run I had seen the Pacheco Fire that started on June 18 about 2 miles north of the Santa Fe ski basin. As of June 27th that fire has burned 9,927 acres and is about 10% contained. So far it has been burning in a northeasterly direction, away from populated areas, including Santa Fe. Several areas however remain threatened including, Santa Fe watershed, Santa Fe ski area, Nambé Pueblo lands, Tesuque pueblo lands and Tesuque Peak communications site. The inhabited communities that are experiencing smoky conditions are in the east including, Mora, Pecos and Las Vegas. The fire that Marcus was referring to is now known as the Las Conchas Fire. On Interstate–25 as we passed Bernallio we could see on the left the massive column of smoke in the Jemez Mountains—looked like a giant bomb had gone off in the desert, sending thick plumes of smoke in the sky. The fire started on Sunday, June 26 about 1pm in the Jemez Ranger District in the Santa Fe National Forest, about 3 miles south of Los Alamos. The Las Conchas fire has already burned more than 50,000 acres—78 square miles, making it larger than the Cerro Grande Fire of May 2000, one of the most destructive wildfires of New Mexico that burned 47,000 acres and 400 homes with more than $1 billion in property damage. So far, the Las Conchas Fire is 0% contained and the wind is blowing at 60–plus miles per hour. Los Alamos fire chief Doug Tucker said that the fire has the potential to grow two or three times in size and that the firefighters have no idea which way the fire would grow given the strong and erratic wind. This is no good news for the public health of our communities. A June 27th press release from the Southwest Coordination Center of the US Forest Service states, “Winds across the region will shift dramatically ... driving smoke from the Las Conchas Fire into Jemez Springs, Los Alamos, and potentially Cuba. With this wind shift, smoke from the Pacheco Fire will likely impact Nambé Pueblo, Chimayo, Cochiti, Santa Fe, and Española. ... Winds will likely become erratic due to the development of some widely scattered dry thunderstorm activity by the early evening hours. ... These areas may experience periods of air quality, which is Unhealthy for Sensitive Groups (those with asthma, lung or heart disease, children, older adults, and recent science indicates pregnant women). Low lying areas close to ongoing fire activity may experience periods with visibility of 1.5–2.5 miles, which is indicative of air that is unhealthy for all groups.” The press release continues to say that if visibility is 1 1/4 miles, air quality is Very Unhealthy; and one mile or less, air quality is Hazardous. We’ve already experienced less than a mile visibility in Santa Fe with the Wallow Fire of Arizona. For someone like me, who likes to walk, bike, hike—the options to be out–of–doors have become rather limited. Time has come for me to enjoy life indoors on the couch and watch The Real Housewives of Orange County and The Real Housewives of New Jersey. When gigantic fires like Wallow or Las Conchas arrive they not only impact human health but also cause massive loss of non–human life. Within thirty hours the Los Conchas Fire has consumed more than 50,000 acres—that is fast. Many animals of the desert are rather slow moving. In harsh places like the Arctic and Desert life move rather slowly, not at the speed of modern humans. The horny toad is a beautiful and gentle creature of our homeland, here in New Mexico. You can pick them up on your hand, gently, and place on your palm. They move slowly and always get burned alive on these massive fires. Do we ever include horny toad or so many other creatures that do burn to death in our discussion of devastation by mega–fires? Fires are part of the natural ecosystem in the American West. However with extreme drought and warmer temperatures—result of man–made climate change, combined with human–induced ecological destruction of land, we’ve entered a new era, when the fires burn hotter, are much larger, and arrive more often. Life in the American West for both humans and non–humans will surely become harsher. For us New Mexicans, we have one more potentially dangerous issue to deal with—what to do with nuclear materials and waste (we do have a lot of that stuff) when the mega–fires arrive? The Las Conchas Fire has already arrived at the infamous Los Alamos National Lab, where the atom bomb was developed; where a number of sensitive tritium facilities are located; and where I worked as a scientist during the mid 90s. Yesterday the lab remained closed and residents were given mandatory order to evacuate due to the dangers posed by the Las Conchas Fire. Thousands of residents left Los Alamos yesterday and the lab will remain closed through Wednesday. Nuclear Watch New Mexico is a great place to keep informed, not only about the potential nuclear contamination dangers posed by the Las Conchas Fire, but also about the potential expansion of nuclear energy and waste in New Mexico. They’re maintaining an informative watchblog that you can check out. 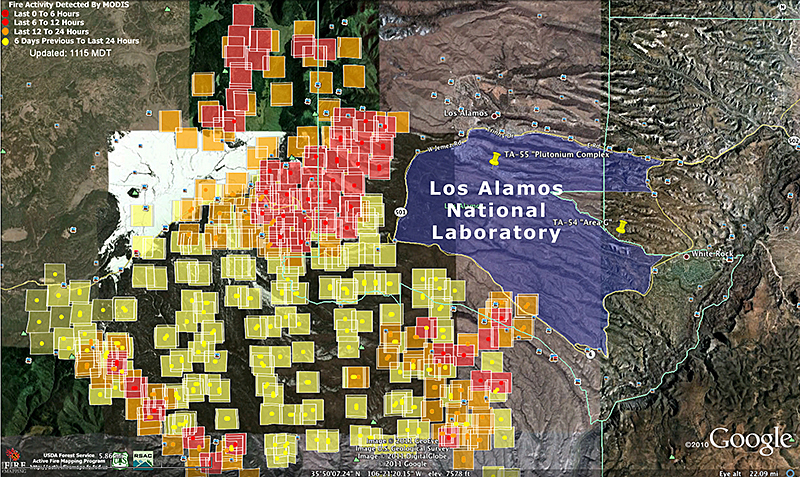 June 28 Satellite Fire Detection Data: Las Conchas–Los Alamos National Lab Boundary. Map courtesy Nuclear Watch New Mexico. We have no choice—let us participate and raise our voice. I first came to know about these nuclear expansions from an April talk in Santa Fe by anti–nuclear activist Dr. Helen Caldicott. Shortly before her talk Dr. Caldicott had interviewed me about my work in the Arctic for her radio program If You Love This Planet. I’ve been paying attention about the ongoing threat of nuclear on our homeland ever since. Let us hope the wind will die down, the rain will come in the land of little rain, the Las Conchas Fire will leave no nuclear trace in our air, and that nuclear expansion of Los Alamos will be canceled.